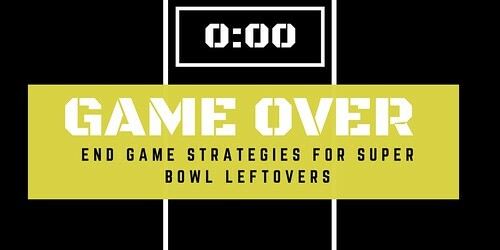 Score Board: Game over – end game strategies for Super Bowl leftovers. The game is over and your team WON, or maybe not. But two things remain after the game — friendly rivalries and lots of leftovers. There are some important rules you need to follow regarding Super Bowl Party leftovers to ensure your loved ones don’t get foodborne illnesses after the game. Did you know bacteria can grow on perishable foods left out on the counter for more than 2 hours? Follow these steps to avoid bacterial growth on your leftovers. Divide perishable food items into smaller portions or pieces, place in a shallow container, and refrigerate (or freeze) within 2 hours after the party. Use refrigerated leftovers within three to four days or place them in the freezer. Use the Cold Food Storage chart to know how long to store food in the refrigerator to avoid spoilage. Did you know you should always reheat leftovers to an internal temperature of 165°F (74°C) as measured with a food thermometer? If food is being heated in the microwave, ensure that the contents are evenly dispersed. Since microwaved food can have cold spots, stir food evenly until the food has reached 165°F in multiple places. Do not use slow cookers for reheating. USDA’s Food Safety and Inspection Service recommends using a stove, microwave or a conventional oven to reheat leftovers. Leftovers are safe to eat once they have reached an internal temperature of 165°F. If you decided to freeze your leftovers, use the Safe Defrosting Methods when you want to reheat. Did you know, the FoodKeeper app can remind users to consume food items before they are likely to spoil? The app helps users understand how different storage methods (e.g., refrigerator, freezer, and pantry) impact the shelf life of food and beverages. With this information users should be able to maximize food and beverage storage times, reducing food waste and ultimately saving money.